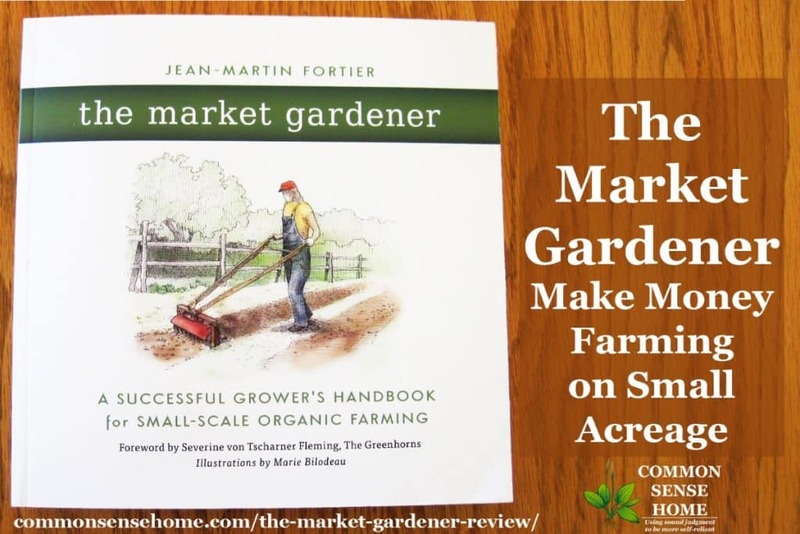 The Market Gardener: A Successful Grower's Handbook for Small-Scale Organic Farming by Jean-Martin Fortier demonstrates that it is possible to earn a good living on a small piece of land, and provides the reader with the tools they need to do it. With under 2 acres of cultivated land, Jean-Martin and his wife aren't just small farmers, they're micro-farmers. They have been supporting their family for the last ten years with just 1 1/2 cultivated acres , and achieving a profit margin of over 40%. I live in a state with large amounts of agriculture, and I know most farmers around here are struggling just to break even, let alone post that sort of profit. How do they achieve these results? Through strategic planning. Minimize Start Up Cost – Micro-scale production eliminates the need for large, expensive machinery, which is a huge expense for many produce growers. Additional tools/materials can be added over time and sometimes purchased used. Appropriate sizing and uniform sizing between beds allows production enhancers such as tarps, row covers and hoops to be moved within the garden with minimum effort, and allows a single item to be used in multiple locations over the course of the season. Minimize Production Cost – by operating on a micro-scale and planning for efficiency of labor, Jean-Martin and his wife minimize the need for outside labor, which typically accounts for 50% of costs of market growers. Sell Direct and Add Value – By cutting out the middle man, direct to consumer sales generate maximum return for the market gardener. Focusing on details that add value to the consumer, such as early season vegetables and unique vegetable cultivars, means that their produce can garner a premium price. There are also detailed crop growing notes, sources for tools and supplies, planting schedules and crop rotation charts. Simple line drawings help to illustrate key points throughout the text. If you're ready to “grow better instead of growing bigger”, this may be the right book for you. It's possible to make a living off the land without a large amount of land. Jean-Martin Fortier and his wife have proved it. 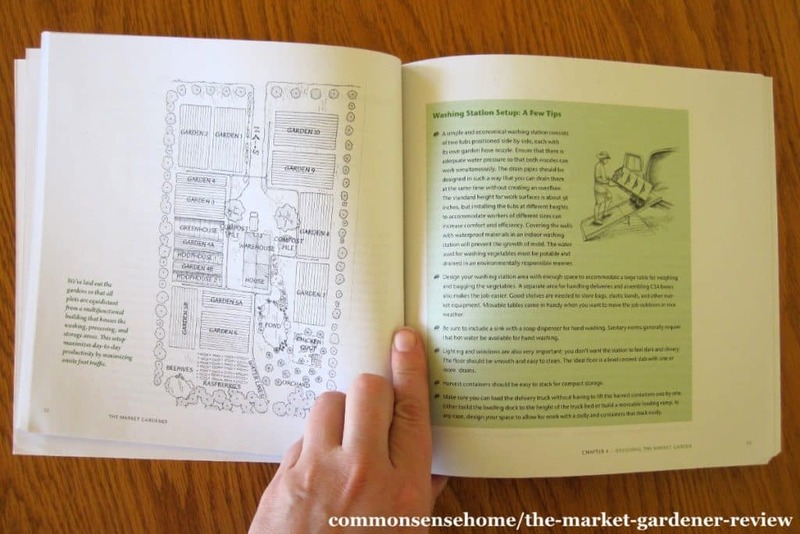 Buy The Market Gardener: A Successful Grower's Handbook for Small-Scale Organic Farming now. I received a copy of the book for review. As always, my opinions are my own. If you have a favorite book for profitable small farming, please share your suggestion in the comments. Originally published in 2014, updated May 2016. Giveaway was held back in 2014 and is now closed. I agree with Mandy. I could fill the page with questions and still not have them all answered, lol. This is great! As a fairly new gardener, I can use all the help I can get. We have lots of standing water in the springtime that, unfortunately, drowned 1/2 of my seeds last year. Any suggestions for dealing with excess water, besides trucking in a ton of dirt to make raised beds? This book sounds amazing for maximizing what you have, making the most of things! I have been seriously considering this so a book on the topic would help. I’ve dreamed about selling my homegrown veggies & fruit at a farmers market, this sounds like a good resource! Thanks for the giveaway! How do you clean your lettuce? I always find grit in my garden lettuce- especially after a good rain when the dirt is splashed deep up into the leaves. Yuck! Now that I have a cow and chickens, I’m trying to learn the right and wrong ways of using their ‘fertilizer’ in the garden. I’d be interested in any tips regarding that. I would love to win this book! Have wanted to run a profitable CSA for years and this looks like a good resource. Looking into starting a small CSA next year – very interested in this book! If you could tell me when spring will arrive this year that would be most helpful. That’s a million dollar question right there! I sure wish I knew, and that it would be soon! We have been working on growing more of what we put on our table for the last 3 years. Last year was the worst year yet for our garden. What direction should rows be planned out in? I don’t usually plant in just rows – too much wasted space and soil compaction – but when I plant in rows within blocks, it varies. Most of the time I plant east to west, and put taller crops to the north ends of beds. Sometimes I plant north to south and use taller plants to shade cool loving plants from later afternoon sun by planting the shorter plants to the east of the tall plants. Prevailing winds, if any, need to be considered, too. I find my corn is a little less likely to tip over in strong winds if I plant the rows in the direction of the winds, but it doesn’t make a huge difference. I am a North-Westcoast gardener who has just moved to semi-arid Colorado. This year is going to be a huge learning curve as far as gardening goes. Any tips on growing food at high-altitude in drought-like conditions? Google “hugelkultur”, “sunken beds” and “keyhole gardening”. All of these strategies may be helpful for making the most of the water that you have. We have a small farm and want it to be self sustaining and organic. We can use all the help we can get! What is the best companion planting guide? My favorite is Great Gardening Companions. This looks a very informatve book. I would love to add it to my gardening library!! I would love to see their layout since this is my biggest issue. I didn’t plan well when I expanded the garden. do heavy feeders just need lots of nitrogen? I would love to know how to make compost. I would love this book , sounds like where we are trying to head! I’ve been working to improve my heavy Ontario clay soil for 10 years but it’s still not great. I compost and add manures, and this past year I’ve spread heavy mulch everywhere. Any extra tips on what I can do to improve tilth? Sounds like you are on the right track. Make sure to encourage soil life, and add some bulky organic matter that will take longer to break down than finished compost. Our last place had heavy clay soil, and by the end of nine years (when we moved), we were just starting to see significant improvement. Oh, I’d love to have a copy! Love this idea! Will be reading this book! can I put too much organic matter in my garden? My son said that it may burn my plants. Hot compost or manure that has not broken down can burn plants. I would find this book very interesting. My husband and I keep talking about market gardening, so this would be very informative. Looks like a great book! Just added it to my amazon cart, but would really love to win a copy!! The points listed under “The Market Gardener Success Strategy” tell me that these folks know what they’re doing. There are too many books out there written by folks who are good at writing, but don’t know the subject matter from personal experience. I can take each of those points and show where they also apply to the software business that I started 19 years ago. That business has allowed me to live and work from my own little homestead on a dirt road. I can work in the garden and work with the chickens and ducks and geese while many of my customers probably think I’m in an office in a large city. Farming is a business, whether it’s a two acre organic market garden or a two thousand acre agribusiness. It sounds like the authors of this book understand that and have found that sweet spot where you are doing what you enjoy and making a decent living from it. I’m looking forward to reading this one. I’d like tips on growing bell peppers to a larger size – mine are always so small! This book looks wonderful and I would love to win a copy! Do you have any suggestions for getting rid of wire worms in the soil without using chemicals? I try to do everything organically and I love potatoes but can not grow them here because of these awful worms. Any advice would be greatly appreciated. Are chickens an option? If you could put some in the space temporarily, they would love to eat and dig out anything that moves and some things that don’t. What is the best material for raised beds? Stone or concrete blocks are the most durable and least likely to leech. In the book, they simply use a specific type of tiller to mound the soil without any structure to hold it. Cedar is good and rot resistant, but pricey. The book looks informative and beautiful, too! I would love to win a copy! This looks like a great resource to have on a permanent bookshelf! Looks like a Book worth reading!!! Would appreciate winning a copy. How can I plant different varieties of tomatoes, corns, melons, squash, pumpkins, ect. and make sure that they will not cross-pollinate? I would appreciate maintaining and producing seed true to each variety. I don’t have much land available but enjoy gardening. I live in a area with a zone 13 designation, without any limitation due to frost. Is there any guild to what can and cannot be grown in land in this zone? We have recieved seed and transplants catalogs, but they usually doesn’t mention our zoning, just up to zone 9. Although I’m aware that some of the plants included strives were I live, I would like to venture with some of the other plants offered in these catalogs, but would like to be sure they will be productive in our zoning. My best advice is to talk to neighbors who have gardened successfully in your area. Some things just are not likely to grow well, others will likely thrive. As for avoiding cross pollination, it comes down to isolation. Corn will cross pollinate over miles, tomatoes tend to be self fertile. Growing a single variety of each is the best way to ensure staying true to type, but to make sure you have a strong gene pool, it’s advised in most cases to have at least 30 plants of a particular variety. This can be tough in a home garden. My favorite book to date on seed saving is “Seed to Seed: Seed Saving and Growing Techniques for Vegetable Gardeners“. I think my husband and I could learn a lot from this book. This book sound great! might learn a few more good things on gardening which I love. Gardening becomes more difficult with age and health issues, so being more efficient is more important than ever. Some tips would be great. With all the critters I have that eat all my kitchen scraps, how do I make compost. My garden needs it, but my compost bin is now empty. That’s a common problem of chicken owners. 🙂 There are two main options – compost the chicken manure, or bring in out side compost or materials to compost. would love this guide, i have been doing the Eden garden, this will be my second year. Very interested in all your methods. I am so excited to read this book. Imagine living off of 2 acres of land AND making a profit. This is my dream!! Can’t wait to see how this works for a Snow-Bird’! As someone from the country and moved to a city, I am so looking forward to this book. My 5 a. garden went down to 1/2 a. so I can use the help. I’d love to learn how to garden and make a living on such a small piece of land! I am excited to read this book! Like said before, I have a lot of questions and I guess the biggest one would how to get started without getting overwhelmed. Planning on moving to a small piece of land and would love to have this book as a reference! We have a lot of clay in our soil. We have been considering adding our veggie scraps directly to the garden. Any experience with this? I tried it for a while at our last place, until the skunks or racoons (not sure if it was one or both, since both were in the area) came in and started digging holes in my garden to dig them up. book looks promising. are there permaculture/sustainable ideas in the book? 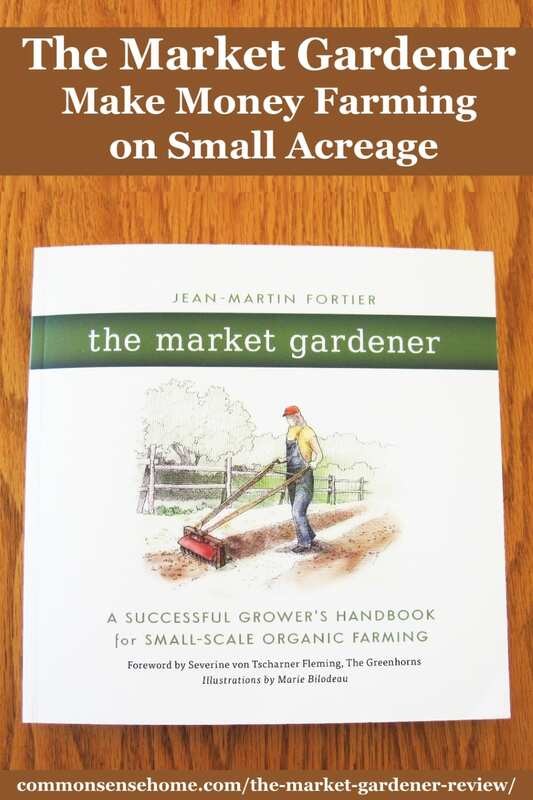 This book is focused on traditional market gardening on a micro-scale, not permaculture. If you’re looking for permaculture, I highly recommend Restoration Agriculture: Real World Permaculture for Farmers. Excellent book by a man who has transformed his farm in southwest Wisconsin to a sustainable polyculture. I’m expanding my garden space this spring and this book should have some useful info! What an inspiring book! Wonder how I can get my husband onboard with expanding beyond our little backyard veggie and herb patch to the whole yard! I was just wondering if there is any manure you can add directly to your garden without aging it first? I need this book! Thanks for the great information on your blog! Sounds very interesting and useful… would love to win a copy. always looking forward to learning new and exciting ways to benefit our family of 7 thank you for sharing. It depends on the length of your growing season and what you are trying to grow. I am in zone 5, so I do the bulk of my planting in spring to give crops time to mature, but I do plant a few things later for fall crops, such as some greens and root vegetables. cold tolerant crops go in first, then warm weather ones after danger of frost has passed. Seeds are started inside for transplanting weeks before last frost, based on recommendations on the seed packets and personal experience. Check “days to maturity” on the seed package to get a rough estimate of time the plant will need to produce. Looks like a great and very informative book! As a side note, was born and raised in Wisconsin and folks currently live in Wausau. I moved down to Central Texas from Madison going on six years ago. My husband and I get up there though as often as we can (though prefer to do it in the summer months when the weather is nice and we can camp). Looks like a very informative book. I’ll have to see if we can get it in at the local library! As first year market gardeners in our 50s, I’d love more info on how to approach buyers. Thanks for the chance to get this good looking book. I heard him speak last summer at the Mother Earth News Fair. He was very inspiring. But he admits, it is very hard work! Yes, no matter what the scale, farming is not a job for the lazy!